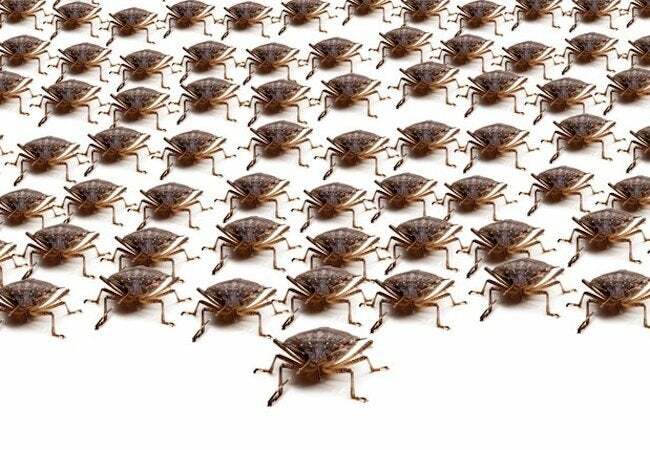 If stink bugs have been making themselves at home within your four walls, it's time to roll up the welcome mat by following these suggestions for eliminating an infestation and keeping the critters out in the first place. Stop! If you encounter an unfamiliar pest in your home, think twice before swatting it with a magazine. If you do anything to bother the shield-shaped, dime-size stink bug, you may suddenly find yourself subject to its foul odor—which actually attracts even more stink bugs! True, that sounds like something ripped from the plot of a bad horror movie, but it’s far from fiction. Native to Asia, stink bugs have proliferated in the United States since first arriving here in the mid-1990s. Today, particularly in the Midwest and along the Eastern Seaboard, they have become a uniquely repugnant household pest. Most of the year, stink bugs breed and feed outdoors, but when temperatures drop in the fall, they seek out a warm spot in which to hibernate through winter. Entering via holes and cracks in the exterior, stink bugs tend to hide in the dark, cloistered crevices of the home—behind baseboards, for example. Because they spend the winter in dormancy, though, it’s possible not even to notice an infestation until the seasons change and the bugs begin hunting for a way back outdoors. That said, it’s somewhat common for stink bugs to emerge earlier, having mistaken an unseasonably warm day for the arrival of spring. Perhaps the best way to deal with stink bugs is to prevent them from gaining access to your home in the first place. To that end, go out of your way to locate and seal the little gaps through which they might intrude. Pay special attention to the trim around windows and doors; here, add caulk or weatherstripping to fill in any breaks. By the same token, make repairs to even minor damage you discover on the siding or foundation. Finally, inspect around utility pipes, behind chimneys, and beneath the roof overhang. In short, wherever outside air or moisture can infiltrate the home, so too can stink bugs. Act accordingly. There are clearly compelling reasons to shore up your home’s exterior, but if there are stink bugs in your home already, then you may want to take them on directly. 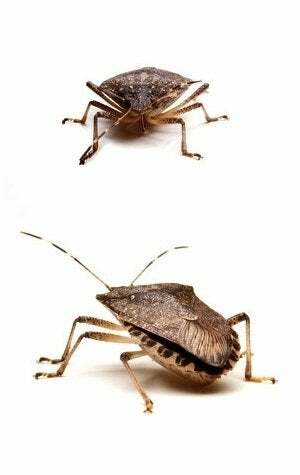 Fortunately, with any of the following methods, you can get rid of stink bugs without creating an awful stench in the process. Vacuuming. For the average homeowner, vacuuming offers the most effective method of removing even a large number of stink bugs. There’s a catch, though. Afterward, you must be very careful with the vacuum bag. Be sure to close it up tightly, right away, disposing of it at a safe distance from your home. To do otherwise is to invite a recurrence. Also, if you have a bagless vacuum, this isn’t the method for you—unless of course you’re ready to trash the now-smelly vacuum too! Detergent. Combine equal parts liquid detergent and water in a spray bottle and employ it to drench any stink bugs you encounter (or any spots where you suspect that they are hiding). Another option: Add the detergent-and-water solution to a small, open container and, using a popsicle stick or a gloved hand, knock or drop the stink bugs into the liquid. The trick here is to work very quickly, fast enough not to give the bugs an opportunity to emit their signature stink. Nicotine. For once, you can be glad to have a smoker in the house! Shred cigarettes or butts into a volume of warm water (use about 20 cigarettes’ worth of tobacco for every gallon). Let the mixture soak overnight, and in the morning, strain out the debris. Next, add about two tablespoons of dish detergent to the liquid that remains, then funnel the solution into a spray bottle. Now you have a spray that kills stink bugs instantly. For safety, wear rubber gloves when handling the solution. Any of the methods described above can go a long way toward ridding your home of stink bugs, so long as you’re dealing with a problem of modest, manageable size. But keep in mind that some homeowners have reported infestations with stink bugs numbering in the hundreds, if not thousands. In such severe cases, don’t hesitate to reach out to a trained pest professional. A certified, licensed expert can put an end to your infestation while also providing advice on how to prevent problems in the future. Now that you’ve gotten rid of stink bugs, it’s time to tackle other household pests. Check out this video on common mistakes that invite bugs into your home.